We love our kitties. Often feisty and funny additions to the household, cats are some of the best friends you will ever have. Loving them can almost come as naturally as breathing. This is why we would want them to be comfortable and warm and not in your space, in the middle of the night, sitting or farting in places farts should not go. They need to have a place of their own, where they can be territorial and completely comfortable, minus the odd painful scratch on your leg. The thing is, finding them a good, cozy bed is not the easiest task, particularly because our little furry babies can be very, very picky when they want to. This is why we went on a full-on hunting expedition. Comfort- Our cats are going to be sleeping in these for extended periods of time. Might as well make them comfortable and usable, right? 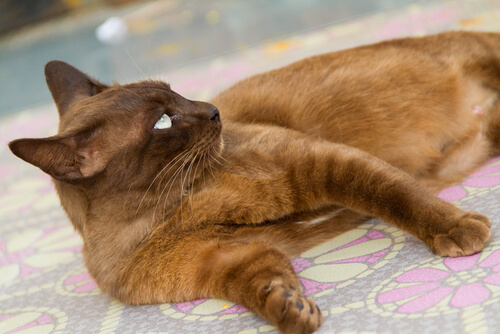 Support- Some cats need a little more care than others, especially when issues like arthritis and hip dysplasia come knocking. It is nice to know your furry friend is not suffering in bed. Customer service: Our reasoning here? Good customer service goes hand in hand with good products. Besides, who wants to be yelled at or completely disregarded by someone you gave your money to? 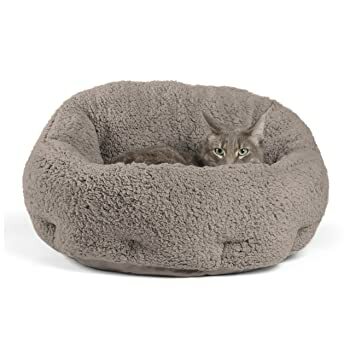 We found the following products to be our top picks for the most loved cat beds. Hope this helps in your search for a suitable bed for your cat! Made with merino wool, this cave is crafted to serve two functions. It is supposed to be your cat’s next favorite nap spot and an interesting piece of décor for whatever room you choose to put it in. Plus, it is pretty easy to clean. Because it is made of wool, it is warm and cozy, making it very suitable for the winter season. Better still, merino wool naturally repels dirt and stains. This includes AIRSOFT fibers, which last much longer than regular second-hand fibers. It doesn’t seem to come in an array of colors, so only available in gray. It’s also soft and flexible, giving it the ability to retain its shape even when the top has been laid on. One thing to note, however, is that, since it is handmade, dimensions may vary slightly from one product to another. Fits more than one kitty. Cats up to 20-pounds can fit. Quality material that retains its shape. Quick shipping & Good customer service. 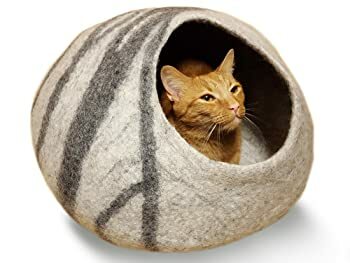 Comes with a wool ball, which many kitties love. Some kitties may not love the cave, though rare. If you have a dog, they might take a liking to it to… which can be a territory problem. We loved the little extra toy that came with it. Plus, it’s durable and easy to use, fitting in practically everywhere. Not just that, since this is made in Nepal, buying this product is helping knitters who might otherwise be struggling. It’s a win-win situation for everybody! 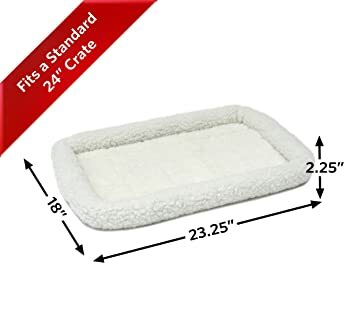 The Midwest Deluxe is advertised as a bed suitable for both cats and dogs. Said to be easy maintenance, it is machine washable and dryer friendly. Not only that, it is good for use within dog crates, houses and carriers, as well as cat carriers. Doesn’t need any support, as it works great stand-alone, with its characteristic imitation of a fur cushion. The rich texture of the faux fur is combined with both quality construction and stitching to make it very durable. It comes in five colors – cinnamon, gray, pink, blue and white. It is fairly resilient, and several items of washing down the line are still very usable. It is a good fit for most crates, as it makes them more comfortable for use. It is foldable, which makes it more portable. 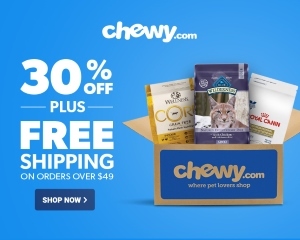 Very good for cats and small dogs as well. Roomy, with a moisture resistant fabric at the bottom. If your pet aggressively chews at things, is very energetic, or likes to scratch/fluff their sleeping area before sleeping, then it will tear much faster than intended. Can create large amounts of lint. Maybe too thin for your pet. Not the best fit for an actual permanent bed. 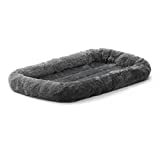 It is advertised as a waterproof bed, designed to be skid-free, made of faux suede or soft velvet. It’s filled with polyester for comfort. Also, it comes with a choking hazard warning for children of 3 years and younger. 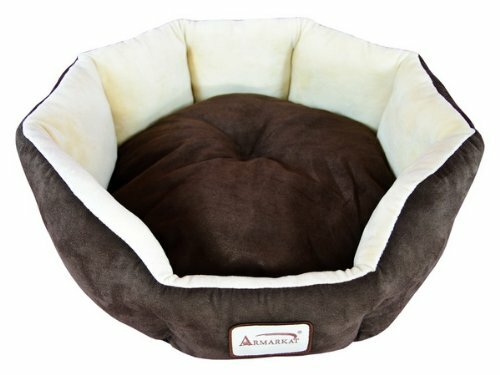 Aeromark, the manufacturer of the Amarkat line, prides itself in providing internationally acclaimed quality pet beds and cat trees. Besides that, they say they provide caring customer service, with fast and reliable dedication and assistance. All their products are said to be pet-centric, safely constructed and durable. For pet beds, in particular, the covers are washable, long-lasting, and resistant to stains. Can be switched over to a cooler cushion side, without fur. Because of this, it can be used in summer. The cushion is machine wash friendly. Is fairly sturdy, and will not generally require extra support. Washing off hair is difficult, though possible. After machine washes, the bed itself does not always hold up its original shape. The structure does not always hold up well for larger felines and dogs. May need extra support for larger size pets. Not every cat will like it, especially if they prefer sturdy sleeping areas over soft. 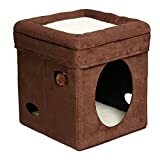 This cat house is marketed as a haven for your kitty or small dog, with an entry width of 7.3 inches, and a height of 10 inches. It is said to collapse for easy storage when it is not in use, and easy to assemble. Each unit comes with a ball hanging within and cutouts for play time. There is also a cushion on top for maximum relaxation. It is also made out of faux sheepskin for the bedding and imitation suede for the rest of the house. A spacious condo for your best friend, the cube is also attractive and compatible with most house décor. The company that makes it, Midwest, claims to have superior customer service, always ready to assist their customers. Another plus is the rigorous testing procedures and evaluation measures to ensure the best possible product for your pet. Sturdy enough to easily sustain the weight of cats of about 15 pounds weight. Fits both small and large cats well. It is warm and cozy. A cat can get its head stuck in the smaller holes, which can pose a danger if you are not home. The balls within the cube are not very durable. Cats can be finicky about the product, though not often. Balls within the cube come with bells, which may cause injury if your cat’s claws get stuck in one of them. It can be even more dangerous with the bells which come attached. In trying to get free, one cat ended up twisting its paw in the wrong direction and could have been seriously hurt if he hadn’t been found in time. Best to cut them off before any damage can be done. Overall, we loved this product, despite some flaws. It requires some adjustments and getting used to. Just make sure your feline will be safe playing around in it. 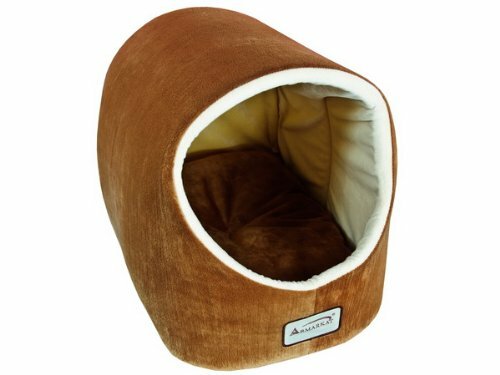 Said to be machine washable, this Amarkat cave bed is also made of soft velvet and has a base designed to be skid free and waterproof. For your furry friend’s optimal experience, it is filled with 100% polyester. The packaging is certified to be complete frustration-free. This Aeromark product also comes with a choking hazard for small children, aged 3 years and younger. The dimensions are 18-inches for length, by 13-inches for width by 13-inches for height. This item only ships to 48 states within the US, unfortunately. The inner pillow can be removed easily for cleaning. Warm and serves well during colder seasons. The bed blends in well with décor. Is fairly easy to wash, for both the insert and the full bed. The bottom of the bed is waterproof. Pretty roomy fit for medium sized cats. May not always hold form straight out of the packaging. Larger cats over 12 pounds may struggle to fit into the bed. The color of the shipped product can differ from photos. The structure is not always very sturdy, and the top of the bed can crumble under a heavy cat’s weight. We liked this one quite a bit, actually. The pros outweigh the cons, heavily. It is a bummer if you want to get this from somewhere other than the United States. However, the quality received was not always what was expected, and there needs to be increased consistency with delivery. 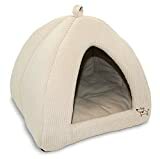 Advertised as a plush tent for pets, this product is made out of corduroy, linen, or faux suede, they all come with a soft polyester-foam lining. This is meant to have the bed mold to your pet’s body for comfort. It can be easily washed by machine and can also be used as a soft crate for easy traveling. Built to last, it is also designed to look great, complimenting most homes’ interior décor. In addition, there is a plush pillow for more comfort. They advise to wash the components on delicate cycle, then air dry. It comes in three sizes, medium, large, and extra-large. It also comes in four colors – brown, beige, grey, and tan. It proves suitable for both dogs and cats, large and small. Soft to the touch, and warm. Larger beds are roomy for cats and smaller dogs. The bottom of the bed may not be well cushioned. There have been some reports of this product coming with very thin material on the bottom side. The arch may not always stay up, depending on the unit. Dimensions are not always shipped as ordered and may be smaller than advertised in some cases. We liked this bed somewhat, but the pros and cons evened out for us. We found that it was okay and mostly performed as advertised. Most of the problems were related to the shipping and handling through Amazon. It can easily work out much better for you. Said to be a self-warming, machine washable cushion for both dogs and cats, it is meant to give joint relief to ailing pets. It is suited for pets weighing up to 25 pounds. Not only that, it provides a sense of security with its high walls, as well as warmth, for better sleep, health, and behavior. The bed is easy to clean, and waterproof at the bottom, saving a lot of hassle. They are made of materials which are safe for your pet. This includes AIRSOFT fibers, which last much longer than regular second-hand fibers. It doesn’t seem to come in an array of colors and is only available in gray. The manufacturer takes pride in their customer care service, so any questions should be easily taken care of. 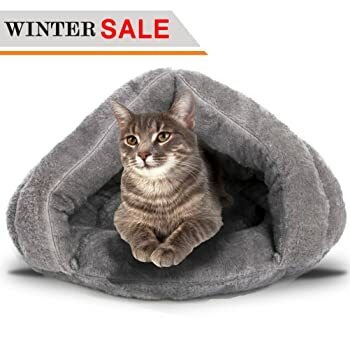 Warm and cozy for both cats and dogs. The bed is delivered on time. Not all units are fluffed up and plush like the picture. Not very sturdy, depending on the pet using it. May not be stable, depending how frisky your cat is. This bed holds up its end about being warm and comfortable, even though it does have a few issues with its size. We would recommend you get it if you have a small pet. You’ll definitely get better use out of it. Made from environmentally safe materials, PP cotton and soft velvet, it comes in three colors; grey, light brown and dark brown. It is claimed to be machine washable, with no linting. In addition, it is suitable for cats weighing 15 pounds and smaller. Each bed is packaged in a vacuum bag, to help ensure cleanliness. It is designed to be warm and fluffy, with the additional feeling of security for optimal satisfaction. Comfortable and warm for pets. Suitable for use in colder seasons. Medium cats may have trouble using it because sizing is not always compatible with pet size. All in all, we found very little problems with this bed. Small pets love it like crazy, and there has not been much in terms of complaints. We give it two thumbs up! Made completely in the US, this waterproof bed is resistant to mold and dust mites. 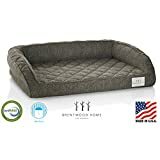 On top of this, it has a 2-inch gel memory foam layer which relieves joint pain, arthritis, hip dysplasia and body aches as it stays cool under your pet. The liner is waterproof, protecting against accidents while providing orthopedic support. It comes with a full 3-year warranty. The soft microfiber is removable and machine washable. However, if you are looking for best results, try air drying it. Very durable and tough, will hold up against scratching. Doesn’t sag or lose shape easily. Low profile and supportive cushion. Roomy for even larger dogs. Decidedly expensive. although that is likely because it is made specifically for pets that are sick or have different health issues. So far, this one is among the best-loved additions to this list. The only issue might be the price range. It’s actually quite pricey but it is made specifically for pets suffering from joint issues. Another thing that we really liked about this bed is that you can trust the size. Medium fits all sizes of the cat and large fits even larger dogs. It works as advertised, and in some cases much better. What more could you ask for? This bed is advertised to warm up with your pets’ body heat, achieved by the same technology used to make Mylar space blankets. This is, of course, an inner layer material, that reflects the pet’s own body heat in order to provide warmth. 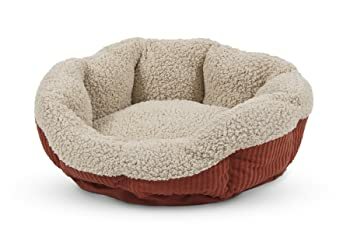 Suitable for cats and dogs, it is also lined with faux lamb’s wool and corduroy, which helps make it cozy for your pet. It does not need electricity to heat up either, so there is no need for a plug or anything extra for that matter.It has a non-skid bottom, meant to provide a safe and hassle-free sleeping arrangement. It is also lightweight for easy transportation and can be shipped to the US. Cats and small dogs are able to use it. Depending on their sizes, can fit more than one cat. Can be used outside the house. Inconsistency in products, not all the beds are similar in quality. Does not necessarily last very long. It does not keep its shape. Delivery can take an incredibly long time. Makes crackling sounds that some cats don’t like, varying in volume. In short, there seems to be a bit of a deficit of good beds that work for larger pets. This is rather sad because we know there are kitties out there with so much more of them to love. But with any luck, this will help you find the one that will work for you and your kitty. 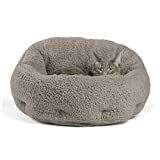 We realize that there may be additional considerations you would like to factor for your cat bed, which we may not have covered in our review. The material your cat’s bed is made out of should be as natural as possible. Reason being, there is less likelihood of getting some odd physical reaction to the bed, necessitating a trip to the vet. Unnatural fibers are more likely to have gone through chemical cleaning processes. This usually has an effect on your pet one way or another. On top of that, the kind of material the bed is made of will determine how long you will have the bed to start with. Besides, what the bed is made out of will determine how easy or difficult it is to wash. For that, it will help to have a removable or washable cover. Some beds do not take kindly to machine washing and end up crumpled and grossly misshapen after the first cycle. The best thing to do is always check to see if washing instructions are provided and follow them keenly. For cat beds, one of the most general and basic things you will want to consider is its functionality. Is it warm enough for the colder winter months? How about summer? Does it keep your cat cool during the warmer ones? That will then help you decide what kind of design is best suited for the bed. For the most part, this is likely to be the cup-shaped or warm mat designs. They both allow the cat to retain body heat throughout their sleeping cycle. In addition, during the summer, your pet shouldn’t get too hot. An open-sided bed will help with that, allowing your cat some relief from the heat, and space to stretch out. You will also need to think about getting a raised bed that has some form of cushion support. This is to allow your cat not only comfort but support. This is especially important in the case of an ailing older cat, with some bone issues such as arthritis. For some cats, raised sides and a roof provide a sense of security (see cave style beds for this option). However, depending on the age of your cat and its preferences, this may not work entirely well. For mature cats, getting in and out of these kinds of beds may be problematic. To solve this, it will need to have at least one very low side for easy entry and exit. And for younger cats, this will require you pay them more attention. What are their current sleeping habits? Where do they tend to take refuge? Answers to these questions will help you know the best position to put the bed in as well. Some places work better than others, and your cat may easily avoid the bed altogether because of the positioning. Decoration also matters in terms of bed structure since beads, tassels, bells and loose threads can be hazardous to your cat. There have been cases where cats have got their claws stuck in some bells or tassels or tried to swallow the beads and loose threads. They are not a particularly good addition to your cat’s digestive system. Did we mention that the size of the holes that may be in the side of the bed matter too? Some beds come in with added features to allow for play, which may come with cutouts. Make sure that they aren’t too small, to avoid your cat suffocating. Décor may also play a part in which design you choose. Considering the bed will be with you for a while, you should think about blending it in with your own home and style. You will need to take a look at your budget and your purpose. Do you want more than one bed for different places in the house? What kind of bed are you looking to get? There are essentially three price ranges you should be thinking about. That is; the standard cat bed, the heated cat bed, and the cat tree deluxe. The standard cat bed range is about $20-$50, while the heated option is around $50- $100. The cat tree is the most expensive, beginning at about $100 and more. That is fairly understandable if you consider how many more beds you are likely to get. These options come with several additions, such as scratching posts, extra bed space, inbuilt toys for play, etc. Some of these are even custom made, to suit both your taste in furniture. The figure usually tends to settle between $2500 and $4500. At this point, it should be pretty clear why you need a budget for the cat bed before you start actively looking. Before making any purchase, always consider the refund policy of the company you purchase from. This will save you a lot of headaches if for whatever reason you are unsatisfied with the product. There are some companies who are well known for their lackluster customer service as well. Checking out the negative customer reviews if there are any, will greatly help reduce the risk of a dud. Besides, this is also a way to forewarn yourself of problems you could encounter. Be careful to check if these are genuine complaints or not. Sometimes there is more to the story than meets the eye.